Ineeded a science class and I like beer, so when I saw "The Principles of Beer and Brewing" in the Gonzaga course catalog, it wasn't a tough decision. The course, which teaches the science behind craft brewing, was begun a few years ago by a visiting professor at Gonzaga University. After a two-year hiatus, professor of biology William Ettinger revitalized the class for the summer session this year. "This is a class I've been wanting to teach. It's a very nice way to learn science," he says. Ettinger, who has 30 years of homebrewing experience, makes sure that the class is scientifically rigorous while also introducing students to the world of craft beer. "I hope that they take home an appreciation for the beer, and for different types of beer. I wanted to introduce them to a wide spectrum of flavors," he says. Ettinger taught the class with a focus on the biology and chemistry that goes into brewing a craft beer. From understanding the germination of barley to the fermentation of sugars, there's more science in a pint glass than one might think. Students learn the science of beer making by homebrewing 5-gallon batches, growing yeast cultures, and of course sampling a few brews along the way. Courses like this one are popping up all over the Northwest. 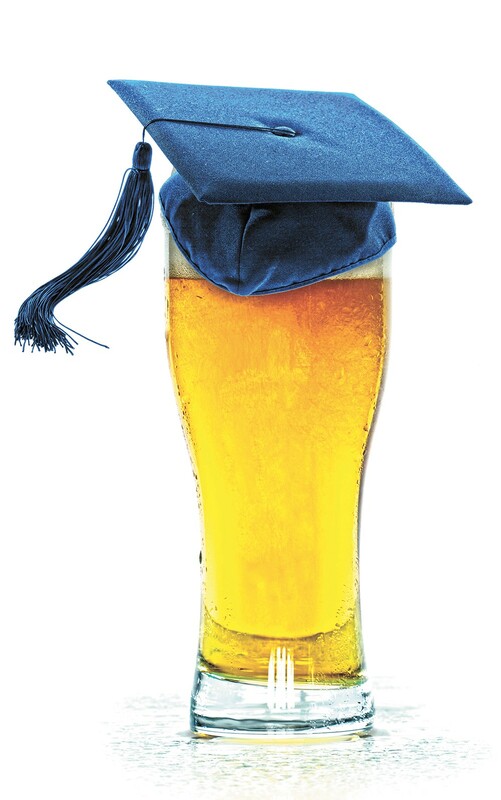 Some schools, like Gonzaga, offer just one or two courses focused on brewing and fermentation sciences, while others, like Central Washington University, offer full degrees. This fall, Central introduces a four-year degree in craft brewing. The University of Portland and Portland State University both offer online certification programs in the business of craft beer. Moose Sanders, brewmaster for River City Brewing, earned a degree in biology from Eastern Washington University, then went to Germany and earned a brewmaster's certificate from a premier brewing program in Berlin. While in the program, Sanders learned about chemical and biochemical reactions in the brewing process, how to analyze water and barley, as well as brewing technology. "If you have enough discipline, you can educate yourself," he says. In the Gonzaga class, I discovered the physiology of hops and how to differentiate flavors and aromas, and came to appreciate the work that goes into brewing a craft beer. So perhaps it's no surprise that I've moved away from cheap American lagers to indulge in local IPAs, sour beers and amber ales. "I learned so much about beer that I'm super interested in it," says Emalise Luzzo, a classmate and brewing associate. "I feel so educated now that I can look at a beer menu and say, 'Oh, IBU's. I know what that means.'"